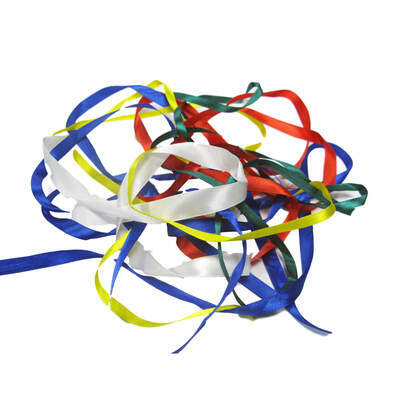 This large pack of Gompels Assorted Ribbons is an ideal addition to any crafting box. Perfect for all ages but especially engaging in nurseries and primary schools, the pack features an array of various coloured and textured ribbons in a range of lengths and widths. These fabric strips can be affixed to most surfaces using general adhesives while also sewing on to clothes and tying around presents for a professional finish. They come supplied in a durable and handy storage bag that can be packed away until required until needed. This large pack of assorted ribbons is sure to get their creative juices flowing with endless possibilities opening up at every use. Why not add our Assorted Buttons to your selection too and kick start a fascination with clothes construction? We also stock many other crafting items to help create the perfect sessions including our Childrens Play Aprons and 12 Block Watercolour Paint Sets - all at exceptional wholesale prices.